Afternoon tea has been an elegant and originally aristocratic British custom since the early 1800s. 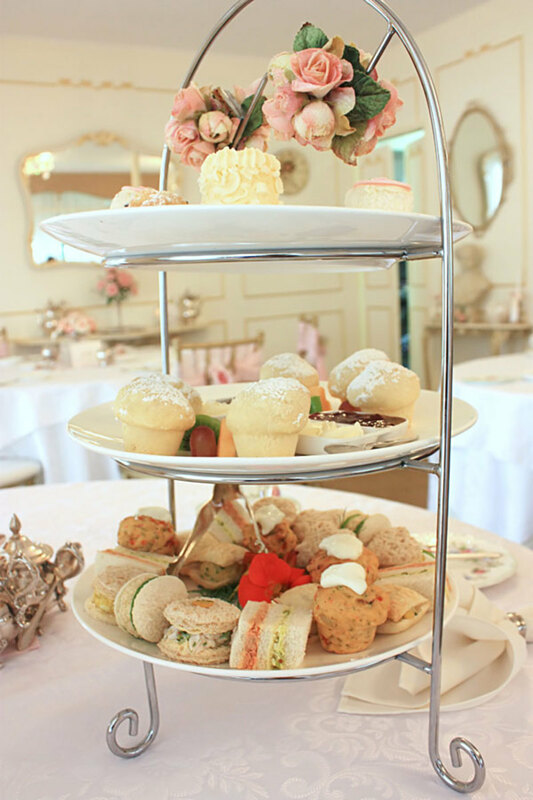 This delectable, dainty meal, which often is referred to (incorrectly) as "high tea" outside of Britain, is the perfect menu to serve guests at a bridal shower, wedding reception, graduation party or afternoon garden party. Anna, the 7th Duchess of Bedford, is rumored to have started taking tea and a light afternoon snack privately in her boudoir (possibly while visiting Belvoir Castle) to tide her over during the long wait between breakfast and dinner (which was served around 8:00 PM). Eventually she started inviting a few friends to join her for a cuppa, a light bite and an afternoon walk. It became such a popular ritual among her circle that it was picked up by other fashionable hostesses, and eventually serving an elaborate afternoon tea became not only a respectable entertainment, but also a fashionable custom in the parlors of London's aristocratic society. These days it remains a beloved daily ritual in the UK, although usually it's just a simple cream tea or tea with a slice of cake or perhaps some biscuits (cookies). The original elegant, three-course service lives on around the world as a festive special occasion meal usually reserved for celebrations and parties. — Henry James, "The Portrait of a Lady"
What Is "High Tea" and Why Is It Called That? If you aren't from the UK and haven't spent much time there, there's a good chance you associate "high tea" with the formal, mid-afternoon, full tea service enjoyed by the cream of London's fashionable society. When you hear that term, do you envision a lavish spread with dainty sandwich fingers and other luxury tidbits, freshly baked scones with clotted cream and strawberry jam, and fancy cakes and individual pastries, and perhaps even a festive crystal glass of chilled champagne? If so, it's a common and understandable mistake. 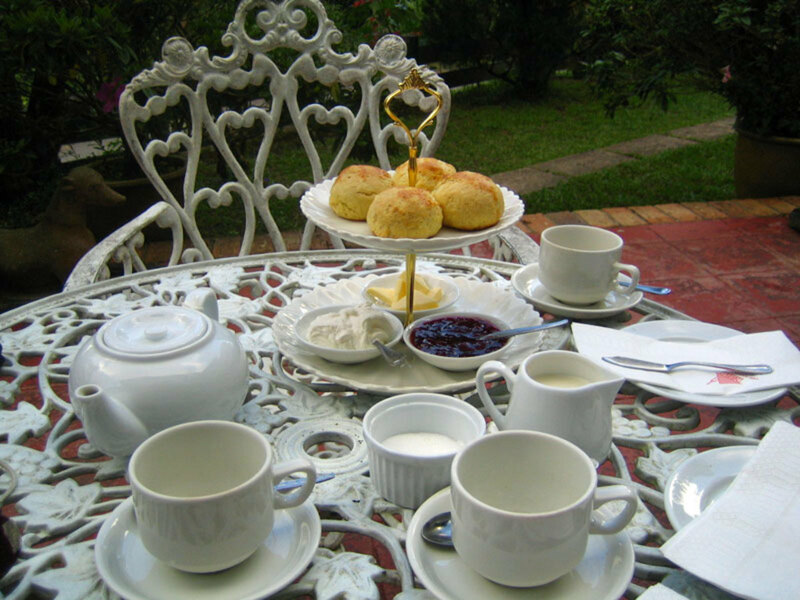 In a social context, "high" and "up" usually refer to the elevation of one's social standing or status (high class, upper class, upwardly mobile) while "low" is associated with an inferior social rank (low class, lower class), so it's natural to assume that "high tea" refers to the elegant, formal tea service made popular by nineteenth-century aristocrats. In the context of afternoon tea, however, "high" and "low" actually refer to the height of the tables at which these meals were usually served rather than to the elegance and formality (or lack thereof) of either the meal itself or the people enjoying it. Traditionally, "low tea", was served on low tables in a garden or parlor, typically around 4:00 PM, just before the daily Hyde Park promenade where fashionable members of London society strolled to see and be seen. So the formal, multi-course meal that many people, and even restaurants, outside the UK often refer to as "high tea" is properly called either a full afternoon tea or low tea. "High tea" was something quite different: a hearty late-afternoon, working-class meal served at a high table, i.e., dinner table. As the main meal of the day, high tea traditionally included meat, potatoes, another starchy side dish or casserole, cheese, bread, and baked goods (and, of course, tea). Many of the world's top hotels offer an afternoon tea service, and there are caterers like the ones my husband and I hired for our wedding reception who can help you put together a fabulous menu for your special event. But you also can prepare your own elegant version to serve to your guests in your own living room, dining room, backyard or garden! I've put together helpful information for creating and serving a wonderful and memorable meal, including recommended menus, instructions on how to brew a proper pot of English tea, delicious recipes for scones, petit fours, lemon curd tarts and trifle, and suggestions for setting a beautiful table. Most are traditional but I've also included some fun, updated variations. Posh not your style? No problem! You can still serve your guests a sumptuous, elegant meal in a more relaxed, casual setting. This six-step guide will help you entertain in style. First, define and envision what a successful event would look like. How many people will be invited? Where will the meal be served? Do you just want to have a close friend over for a long, casual chat over a plate of scones? Do you want to impress your local PTA members? Are you inviting several couples over on a pleasant spring or summer afternoon to enjoy the weather and a light meal? Are you hosting a bridal or baby shower? A wedding reception? Indoors or outdoors? At your home, someone else's, or another venue? How long do you want your guests to stay? How much preparation do you want to do? Do you envision a formal event or a casual get-together? The answers to these questions will help you set the right tone with your invitations, design an appropriate menu and choose the table settings, serving pieces and decorations to achieve your goal and delight your guests. Once you have decided on your guest list, give some thought to your invitations. These should not only help build anticipation for the event, but also set your guests' expectations about the tone of the event so they can feel comfortable that the attire they choose will be appropriate to the occasion. Even a formal afternoon tea doesn't need to be fancy! If your style is more casual, let your invitations and writing style reflect that. Let your personality show! Some fonts to consider: Sofia, Architect's Daughter, Pacifico, Black Jack, Daniel, Desyrel, Indie Flower, Jinkie, VAG-Handwritten, vincHand. Start by deciding how many courses to serve — and how fancy or elaborate you want each course to be. A pot of brewed loose tea served with milk and sugar is the only must-have for a traditional British tea service, although thin lemon slices (never lemon wedges) frequently are offered for those who prefer their beverage with lemon rather than milk. If you also serve scones, jam and clotted cream (also called Cornish, Devonshire or Devon cream), it becomes a "cream tea". 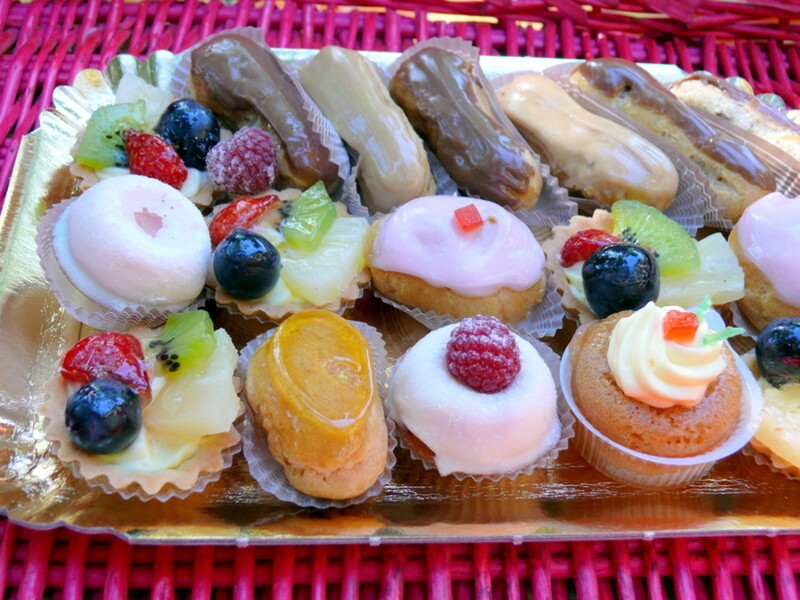 A "light tea" is a cream tea plus sweets, such as biscuits (cookies), cake, or pastries, such as individual fruit tarts. Savories, such as finger sandwiches (sandwiches with the crusts removed and cut into "fingers") or small finger food appetizers. Scones served with jam and clotted cream. Sweets such as cookies, shortbread, cake slices or individual serving-sized small cakes, or pastries. This is what is often referred to incorrectly as "high tea". A "champagne tea" is a full afternoon tea served with a glass of champagne. Many luxury hotels including Claridge's, The Athenaeum Hotel, The Ritz, The Four Seasons, Brown's Hotel, The Berkeley Hotel, The Dorchester Hotel and The Chesterfield Hotel Mayfair in London serve one or more elegant variations. Some establishments offer variations that bear little resemblance to the traditional menu. For example, The Chesterfield Mayfair Hotel in London serves not only The Chesterfield Traditional and The Chesterfield Champagne Tea but also The Chocolate Lover's Tea, which substitutes hot chocolate or a dark chocolate or vanilla white chocolate milkshake as the beverage, as well as a Little Prince and Princess offering with "jam and peanut butter sandwiches, cupcake and ice cream, and a choice of milkshake or soft drink." No doubt the Duchess of Bedford would be horrified at these offerings being referred to as "teas", but tourists traveling with children surely appreciate having options tailored to younger palates while the adults enjoy more sophisticated, traditional teatime fare. Vote for Your Favorite Afternoon Tea Food or Beverage! Which of the following foods or beverages do you (or would you) look forward to most at a full afternoon tea service? The hot tea, of course! I don't care for any of them. If you're having a friend or two over and want to serve them "a little something," this simple menu is a lovely alternative to the typical American offering of coffee and cake or cookies. In Devonshire, traditionally each half of a split scone is spread with the clotted cream, then topped with strawberry jam. 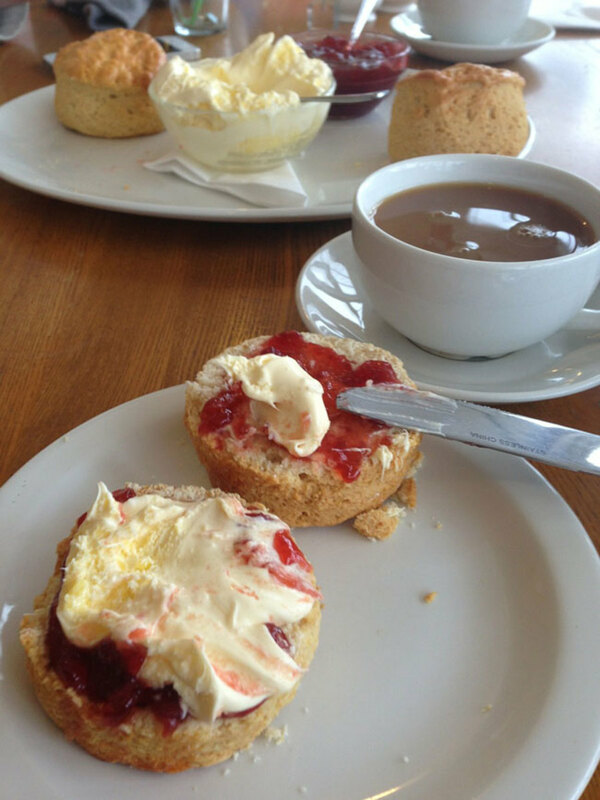 In Cornwall, the split scone halves are spread with the jam first, followed by a layer of clotted cream. One or more pots of strong, hot, freshly brewed tea should be served throughout the meal. If you're serving a full afternoon tea, the first course should be savory finger foods, usually including an assortment of dainty finger sandwiches. If you're serving a light or cream tea, you can skip this savory course. 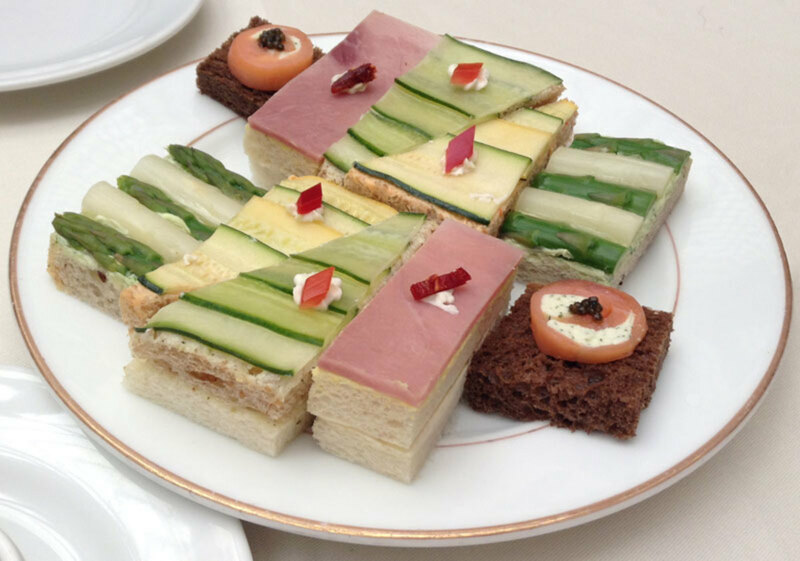 Small, crustless tea sandwiches cut into "fingers" or other small geometric shapes are the most frequently served savory item for this type of menu. Traditionally, these are open-face sandwiches, although enclosing the filling between two thin slices of bread is an acceptable alternative. 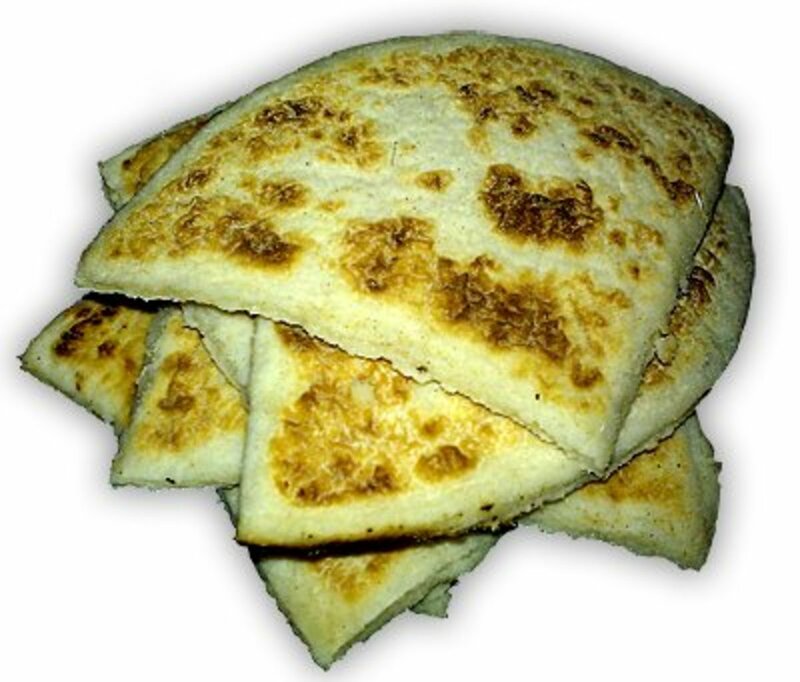 The bread should be firm, thinly sliced, and moistened with a very thin layer of butter or another spread. Traditional fillings (toppings, actually, since the sandwiches are open-face) include paper-thin slices of cucumber or radish, egg salad, and thinly sliced smoked salmon with capers. My tea sandwich recipes offer many elegant and delicious bread, spread, filling and garnish combinations. Individual miniature quiches or or small slices or squares of a thin quiche may be served in place of, or in addition to, the sandwiches. Very small portions (just enough for a few sips) of hot or cold soup topped with a pretty garnish are another nice addition to sandwiches for the savory course. Avoid chunky soups, very thick soups, or soups with ingredients that can't be sipped (such as wontons or meatballs). Instead, choose something smooth that will go down easily, such as hot consommé or chilled vichyssoise. Consider serving a hot soup in espresso or demitasse cups or small Asian style tea cups without handles. Cold soups look beautiful served in pretty schnapps glasses, cordial glasses or shot glasses. "When tea becomes ritual, it takes its place at the heart of our ability to see greatness in small things." — Muriel Barbery, "The Elegance of the Hedgehog"
Whether you're serving a simple cream tea, a light tea with finger sandwiches and savories or a full afternoon tea with sweets and desserts, scones are an essential part of the menu. Scones with clotted cream and jam should be the second course, after the savory course. You'll find many terrific scone recipes online and in cookbooks, some traditional (such as Alton Brown's version on the Food Network site) and others decidedly nontraditional (such as Deb Perelman's mouthwatering Roasted Pear and Chocolate Chunk Scones recipe on the Smitten Kitchen blog). Lemon curd is a delightful alternative (or addition) to preserves to accompany the scones. Homemade lemon curd has a much brighter, fresher taste than commercial curd, and it's quick and easy to make from just a few simple ingredients: lemon juice, fresh lemon zest, sugar, butter, eggs, and sometimes salt. use a thermometer and remove the curd from the heat at 170 °F. The resulting spread is thick, silky, tart, sweet and bursting with fresh citrus flavor, just as it should be. I've also substituted lime zest and juice for the lemon in this recipe to make a refreshing lime curd. While it's certainly not traditional with afternoon tea, I think it's wonderful on scones along with a bit of raspberry jam. If you prefer a less tart, in-your-face taste, try Stephanie Jaworski's JoyofBaking.com lemon curd recipe, which includes a video demo that you may find helpful is this is your first time making fruit curd. Nearly any dessert that can be made or served in very small, individual portions can be part of the sweets course of your menu. Get these from a good French bakery or, if you're feeling adventurous, make your own. These are on my baking bucket list, but unfortunately, we are currently without an oven (and I'm feeling serious baking withdrawal!). While waiting until we're able to buy a new oven, I've bookmarked the wonderful French macaron recipe troubleshooting tips from the Not So Humble Pie blog, which cover many of the professional tips I've learned from Food Network shows in one convenient place. I encourage you to review these troubleshooting tips before attempting your first batch of homemade macarons (or if you've had trouble with previous attempts). I love this baking blogger's trick of slightly overbaking the macarons, filling them and letting them mature for a few days to restore the nougat-like interior texture of the cookies while retaining a crisp outer shell. 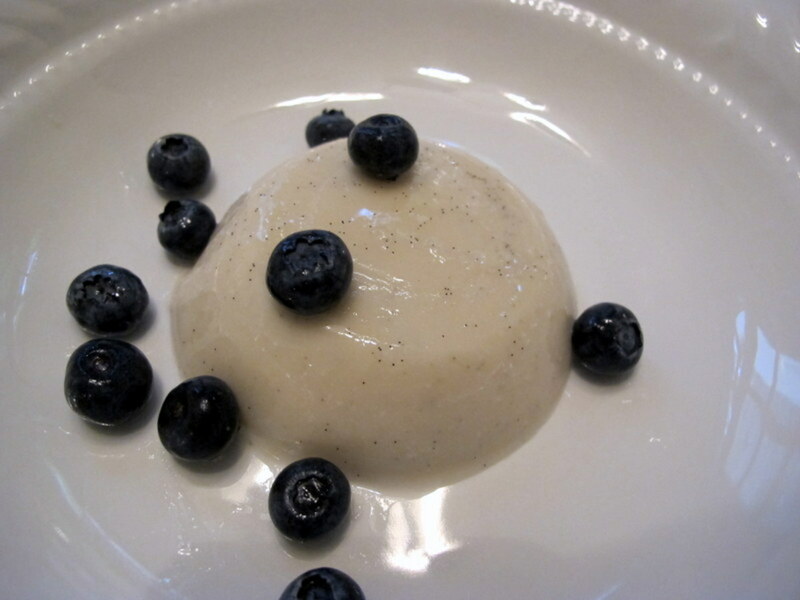 This dessert is easy and fun to make, and there are loads of good recipes online. When making whichever one you choose, I recommend using caster sugar (superfine sugar) rather than regular granulated sugar so it dissolves completely, and crisp Savoiardi-type ladyfingers rather than soft, spongy ones. Prepare the tiramisu in a large rectangular baking dish. After chilling, cut it into 1½-inch by 2-inch rectangles if you're serving it as part of an assorted sweets course. Get them from a good local bakery or make your own. They're actually a lot of fun and easier than you might think! In fact, I made my first pâte à choux — the dough used to make cream puffs, éclairs, profiteroles and gougères — when I was only 10 or 11. The only hard part is stirring/beating the flour in all at once into the boiling water, butter and salt in the saucepan (I was taught to use a wooden spoon), since it becomes very thick, very quickly and requires a lot of "elbow grease" to keep stirring the dough briskly until it is a smooth mass. If you're looking for a recipe, try the one on the King Arthur Flour site. Dump all the flour at once into the boiling water, butter and salt mixture and IMMEDIATELY start beating it in vigorously so you don't get a bunch of lumps. Let the cooked mixture cool for a few minutes and then beat in the eggs quickly, one at a time, at high speed and continue to beat for another two minutes so the mixture is smooth and thoroughly homogenized. When the pastries are baking, don't open the oven door until it's time to remove the pastries, so that they don't deflate (the same reason you can't peek inside the oven when you're baking a soufflé). After removing them from the oven, quickly cut a slit in each éclair or cream puff and return them to the oven for another five minutes to let the steam escape. This is the secret to a crisp rather than a soggy pastry shell! Buy or make them. Top each mini cheesecake with a perfect, fresh berry (or several). You can also melt jelly or jam, strain it, let it cool until it's still warm but no longer hot, and then spoon it over the cheesecakes (and the berries, if using) and refrigerate them to add a lovely, tasty glaze. These are easy to make, or you may be able to buy them at a local gourmet shop. I strongly recommend making them the same day you will be serving them. My chocolate dipped strawberries with drizzle recipe is quick, easy, elegant and delicious! This is a classic Victorian English sponge layer cake, two cake layers filled with jam and dusted with powdered icing sugar; named after Queen Victoria, who is said to have enjoyed a slice with her afternoon tea. What could be more traditional? Buy them at a good bakery or bake and decorate them yourself. If you’re pressed for time (or just don’t enjoy baking), try my Easiest Petit Fours recipe. Then decide how to embellish your petit fours. Something as simple as a single, fresh, ripe berry can be effective, or you may want to do something fancier, like chocolate lace. There are many excellent options for decorating petit fours! Serve your trifle in mini trifle bowls or small glass cups or glasses with espresso spoons. Pecan tassies, mini chess pies, mini fruit tarts, lemon tartlets, etc., are a lovely choice. To make delicious, easy chocolate tarts, buy premade tartlet shells, fill with homemade chocolate ganache, and top with a dollop of homemade whipped cream and/or a single, fresh berry and a small mint sprig. seasonal and holiday themes, including a Valentine's Day tea tablescape with red roses, red napkins, a white table runner, and Johnson Brothers' romantic English Chippendale china. If your entertaining style for this event is traditional and formal, consider an elegant damask or lace tablecloth and napkins in white or ivory. For a contemporary update, consider a colored tablecloth topped with a white or ivory lace one, so the colored cloth shows through. The centerpiece should provide a decorative focal point that visually anchors your tablescape. Keep the following considerations in mind when choosing or designing a centerpiece. A lush bouquet of seasonal flowers in a pretty vase is traditional, and my favorite centerpiece for this type of entertaining. But it's far from the only option! Seasonal centerpieces, such as holiday ornaments, fruits, etc., can be a lovely alternative. Make sure the centerpiece is appropriately sized for the table, so that the table settings aren't cramped. Also consider the height; it should be tall enough to be an obvious focal point for the tablescape, but not so tall that guests will have trouble seeing the guests across the table from them. If you will be seating guests at multiple tables, make sure to have at least one centerpiece for each table (more, if the table is very long). If it's a formal occasion, such as a wedding reception or engagement party, this Godinger crystal and silver 3-tier server is an elegant and timeless choice. I've purchased several Godinger serving pieces over the years, and this manufacturer's quality is very good, especially for the price. All the pieces I have owned or seen in fine gift stores have looked much more expensive than their price tags. The three crystal plates in this server can be removed from the frame or rack for arranging the food or washing after the meal. Because the plates are removable, I recommend filling them and then bringing them to the table before placing them in the rack, which is fitted with rubber feet to avoid marring the table or cloth and folds flat for convenient storage. 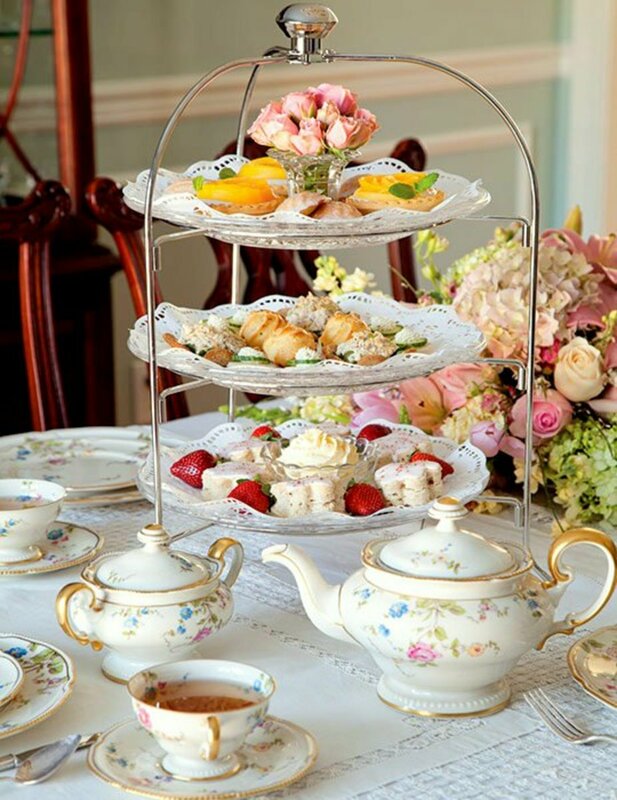 If you're going to go to serve a traditional English afternoon tea menu with finger sandwiches, homemade scones, biscuits (cookies), shortbread, cakes, fruit tarts, etc., my feeling is that you might as well take the small amount of extra work to brew a traditional pot of loose leaf tea, which will result in a more flavorful beverage. But since these days even proper Brits often use tea bags when brewing their daily cuppa, feel free to do the same if you prefer. A tea kettle for boiling the water on the stove; ideally one that whistles to let you know when the water has built up a good head of steam. Note: You can't achieve the necessary full head of steam by boiling water in a saucepan or in the microwave! Clean-tasting cold water, either soft tap water or filtered water. Good-quality loose black tea or tea bags, preferably from a tin. 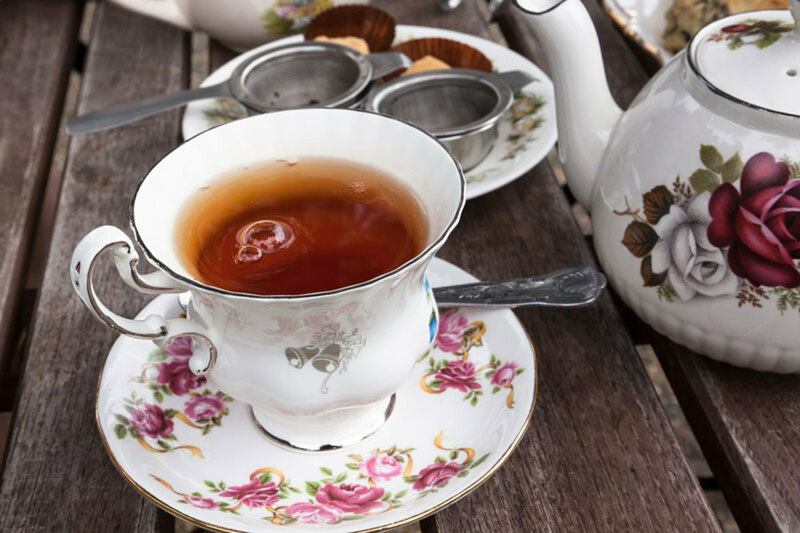 Earl Grey, Darjeeling, Assam and Lapsang Souchong are popular choices; note that Lapsang Souchong, which has a deep, smoky flavor, may be an acquired taste for people outside the UK. A proper teapot made of ceramic or china, preferably one that has sieve-like small holes inside where the spout is attached. Note: Silver is more formal, but china or ceramic works better. A tea cosy (AKA tea cozy) to keep the tea hot for proper steeping and serving. A tea strainer or small mesh sieve to strain the leaves while pouring (unless you are using tea bags). Warm the teapot and place it next to the stove. To do this, boil some water (the microwave is fine for this part) and pour it into the teapot. Cover the teapot with its lid and swirl the water around inside of the pot to warm it up. Then pour out the water and place the teapot next to the stove (where you will boil the fresh, cold water for the tea). It's important to keep the teapot right next to where the kettle will be boiling to minimize the loss of heat and steam inside the kettle between the time it is lifted from the stove top to the time the water is enclosed inside the covered teapot - hence the old saying, "Bring the pot to the kettle, not the kettle to the pot." Add the loose tea or tea bags to the warmed teapot. 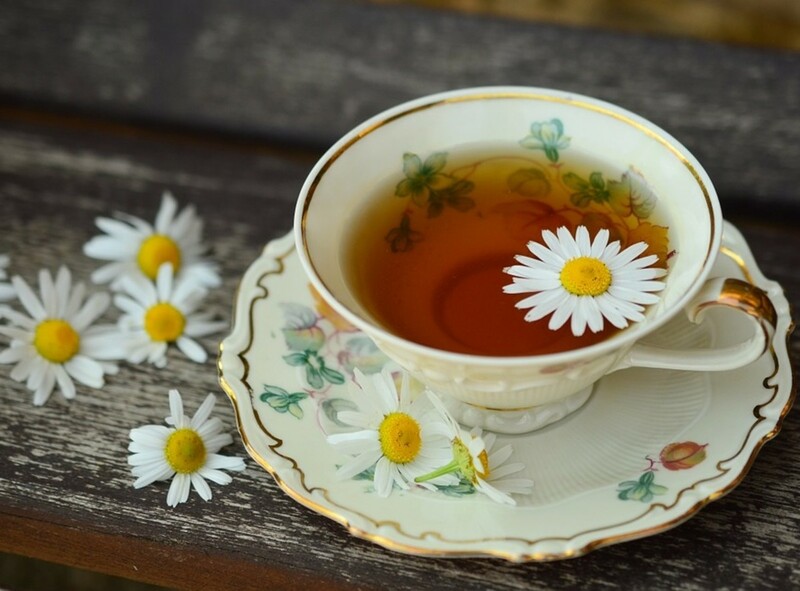 The general rule of thumb is one teaspoon of loose tea or one teabag per full cup of water, plus one extra teaspoon or bag for the pot if you prefer strong tea. Boil fresh cold water in a tea kettle. Always start with fresh, cold water (if the water is hard where you live, use filtered water). Pour it into the tea kettle, leaving enough headroom at the top so that the water can boil vigorously and develop a strong head of steam. 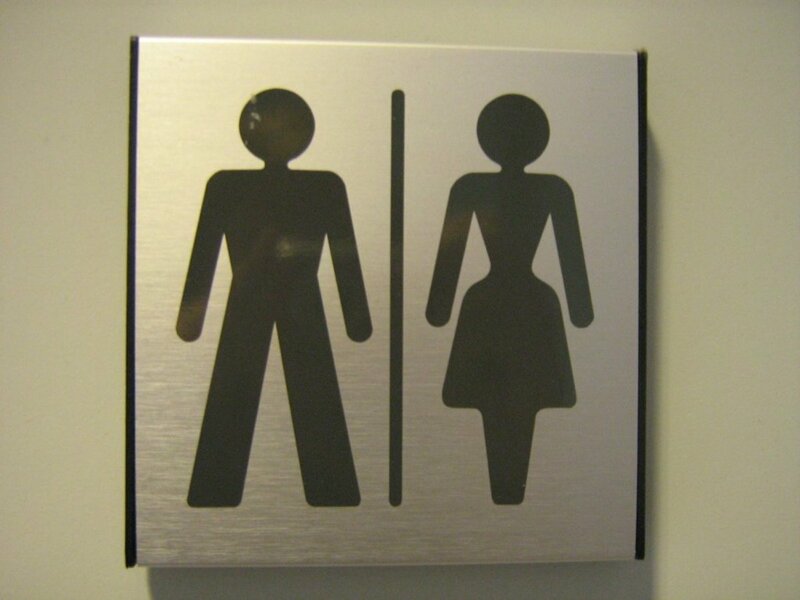 (Some kettles have fill lines.) Heat it on the stove until it reaches a full, rolling boil and builds up enough steam to make the kettle whistle. Steep the tea leaves. Even if you don't use a whistling tea kettle, you'll know when the water reaches a full, rolling boil because steam will be pouring out of the spout. The moment that happens, immediately pour the water over the tea leaves in the warmed teapot and cover it with the lid as quickly as possible. Cover the pot with the tea cosy to keep the tea hot and steep for 3 minutes. Stir the tea and remove the tea bags, if you're using them. Pour the tea. If using loose tea, place a tea strainer over each cup before pouring the tea. Allow it to drain and then remove the strainer to a drip cup. Don't leave the water boiling before you pour it over the tea; as soon as the kettle is steaming, immediately pour the water into the teapot. This ensures the perfect water temperature for brewing and retains the maximum oxygen in the water. Don't allow the boiling water to cool and then bring it back to the boil before pouring it into the tea pot. Twice-boiled water has less oxygen in it, which can flatten the taste of the tea. If you aren't able to pour the water over the tea as soon as it builds up a good head of steam in the kettle, pour it out and start again by boiling fresh, cold water. Take care not to burn your hand on the scalding hot steam when you pour the water into the teapot; consider using a potholder. Use a proper teapot for brewing. Earthenware teapots hold in the heat best, but a more elegant bone china or porcelain tea pot is fine, too, if you use a tea cozy. A cozy keeps the water in the teapot hot while the leaves are steeping, and also keeps the brewed contents hot for those who want to enjoy a second or third cup. Don't let the tea steep any longer than 3 minutes (or the maximum recommended steeping time for the type of tea you are using) so it doesn't become bitter. The key to strong tea that tastes good is adding more tea to the water, not extending the steeping time. Before your event, read my article that explains how to properly chill, uncork and pour champagne and the best shape of wine glasses for serving it. Follow the four simple steps to learn to serve champagne like a professional sommelier! Have You Ever Served or Been Served Afternoon Tea? Thank you, Coral! I hope you have a chance to take advantage of the article’s suggestions. This is was such a great article. I want to save it. Thanks, Sandy. I do love a nice, hot cuppa, especially when I allow myself to have a scone, pastry or small slice of cake to go with it! That is a lot of tea. Pastry and tea does sound good. Thanks very much, Merry! I, too, was surprised to learn that the formal afternoon tea we think of as "high tea" was actually called "low tea" and that high tea was a hearty working man's lunch. Calling it by the wrong name will be a hard habit to break. So glad you enjoyed my recipes! What an amazing article, Margaret. It was a surprise to know that high tea was more of a meal, while low tea was what we think of afternoon tea. Your recipes look wonderful too! The tradition of it alone makes it a delightful pleasure, doesn't it? Sweet! I love everything about it. Goodness, I truly enjoyed reading this lens. I really and truly got lost in it and am now craving some petits four and savory finger sandwiches. Wonderful lens. There are a couple of places that serve elegant tea here in San Francisco, and we treat ourselves to them a few times a year. It is great fun. Thank you for the history lesson and all the how-tos. I'm especially keen to try your ginger raspberry scones and to look up some of those lemon curd recipes. Excellent lens. Thank you for all your work on it. As a Brit, I REALLY love this lens, because it reminds me that, on occasion anyway, I can give way to decadence and indulge myself in a local cafeteria, with a truly indulgent afternoon tea! Great lens! Never thought about afternoon tea at all until we stayed at a boutique hotel in San Francisco one year. They had a regular afternoon tea, and we rushed back to enjoy it. Turns out, what we liked best were the other gets. Teas, etc., are just good excuses for slowing down long enough to get acquainted. Love this lens! My wife is English and we occasionally have an eccentric afternoon tea! What a wonderful lens. I had a terrific one in Disney at the Grand Floridian where the manager then and the pastry chef were personal friends. You just reminded me to bring a friend here at the Metropole. What a fabulous resource for an afternoon tea! I smiled when I saw the lemon curd recipes! Years ago I had a recipe that called for lemon curd and simply had the worst time finding lemon curd or a recipe to make lemon curd. I, did indeed, see several recipes featured here that I would enjoy trying and I am definitely ready for a nice afternoon tea! Fabulous Lens! Oh please invite me to tea - so civilised and all so delicious! Where did those days go? Now we all rush rush rush and work all the hours and grab and go. Time to turn the clock back I think. When my mother was alive I loved to take her to one of the posh hotels and have an afternoon tea with all the trimmings. @anonymous: Thanks for the lovely feedback! This is an excellent example of superior writing. It's been very useful for me. Everything is very open and represents very clear explanation of issues. Really blogging is spreading its wings quickly. Your write up is a good example of it. Your website is very useful. Thank you for your post, I look for such article along time, today I find it finally this postgive me lots of advise it is very useful for me. I will pay more attention to you , I hope you can go on posting more such post, I will support you all the time. This was just what I was on looking for. I'll come back to this blog for sure! I bookmarked this blog a while ago because of the useful content and I am never being disappointed. Keep up the good work. Everything looks better after a nice cup of tea. Thanks for a great post. @Chris-H LM: Hi, Chris! I'm not a Brit myself, just an Anglophile a tea- and history-lover. :) Thanks for your wonderful comments and your kind angel blessing! What a delightful lens! My Sensei performed the Japanese Tea Ceremony when I received my Blackbelt and I have since acquired a fondness for Jasmine Tea. I moved not long ago, but I may have to unpack my teapot. Blessed! I learned so much from this page. I was surprised that I was wrong about what high tea was. Great page and the recipes look wonderful. blessed! I am such a huge fan of tea, I travel the world for it. My favorite is the Royal Hawaiian which is a Asian black tea with a touch of passion fruit and princess flower. Love the teapots! @knitstricken: Thanks for that lovely compliment! 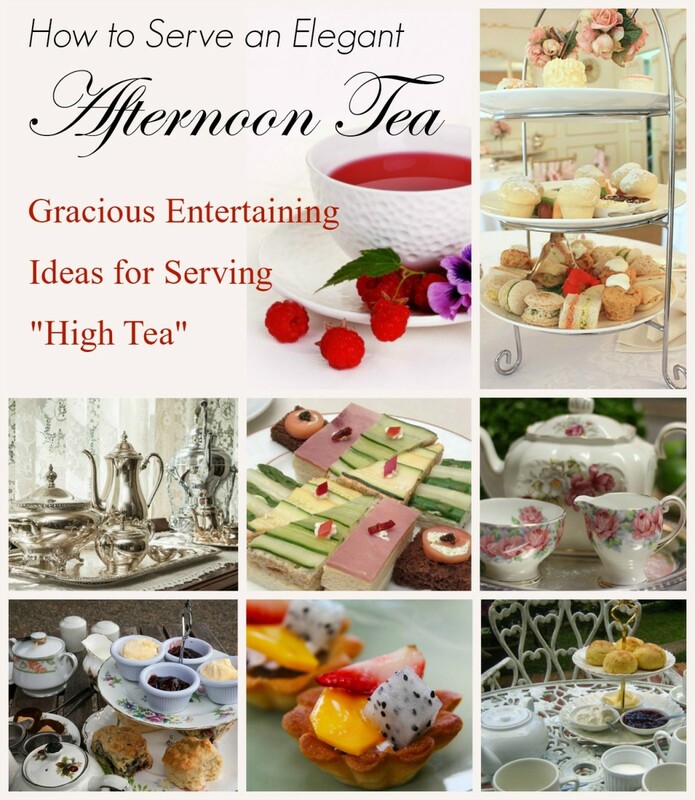 You have really presented high tea and low tea and everything tea in a really nice way. It's been a long time since I made lemon curd, you reminded me of this delightful spread! Lovely, lovely, lovely lens. You've set a lenscrafting example for me to which I shall aspire. @BrianRS: Thanks very much for the lovely compliment, Brian! I was drawn to the typically British traditions of this lens and have to say you have done a great job explaining all the differences. Oh, my goodness! Very beautiful and informative Lens! I have been dying to host a Downton Abbey theme party--and thanks to your MANY suggestions, I feel inspired to serve a proper tea instead of a predictable dinner! Thank you for sharing! @dellgirl: Thank you so much for your kind support and angel blessing. Much appreciated! @anonymous: Thanks so much for your recommendation. My lasts trip to England was about 25 years ago, but if I am lucky enough to return I definitely will try to get to York and will seek out Betty's! If ever in England, you must travel to York and have tea at Betty's. It is an experience you will treasure and never forget. Each time my sister-in-law visits England she returns with goodies for me from Betty's. What a fabulous, marathon lens! Although I'm English I've never been offered a 'real' afternoon tea, complete with cake stands etc. Nor did I know the difference between high and low tea. What I do know is that we used to have breakfast, dinner and tea (I now know it to be 'high tea'), while more middle / upper class people had breakfast, lunch and dinner. It's all very fascinating. @rayncathy: Thanks so much for your lovely feedback! It means a lot to me. I love afternoon tea. It's a real treat to go to an expensive hotel for it. I am not a tea drinker but found your lens fascinating and interesting. You have put so much into this. Thank you for sharing with us. I lived in England for years and NEVER had a traditional tea! I think it's a bigger deal here than it is there, at least among those who aren't in the upper class, I guess. @crstnblue: Oh my goodness - your wonderful feedback totally made my day! Thank you SO much for your kindness and for your squid angel blessing! One of the best lenses that I ever read! Complex, informative and fun! Thumbs up for your wonderful work done here, Margaret! I'm glad you enjoyed this lens even though you're not a big fan of tea. Thanks so much for your blessing! @MiaMusement: Thank you so much, Mia, for that wonderful compliment! I'm not big on tea, but this lens is AMAZING. I do like scones, though, and never knew the mini pans existed. Thank you! @JLally: Thank you, John! I really appreciate your lovely feedback and agree completely with your sentiments about afternoon tea. @MartieG: It sounds like you have wonderful memories of those special times together! Many thanks for the lovely feedback and for your kind blessing. Very nice! I love afternoon tea which, before I read this lens, thought was high tea. I love eating small sandwiches, followed by petits fours, with a cup of tea. @eightieschild: Wow! Thank you SO much for that wonderful compliment - both your lovely words and your vote in the January food club quest. I'm delighted and honored! @Jo-Jackson: I'm so glad you enjoyed this lens! Thanks very much for letting me know. @Gypzeerose: Rose dear, I'm so very sorry to hear of your sister's recent passing. I hope that the memories of time spent with your dear sister will be of comfort to you. Hugs! Fascinating lens! Afternoon Tea always sounds so relaxed and gentle. It's about slowing down and taking a little time to chat. I did not know the difference between high tea and low before. Very enjoyable read. Reading this great lens is bittersweet for me, as my tea-loving Anglophile sister just passed away. We ate tea together on Victoria Island. Pinned to my tea and coffee board, blessed. I enjoy having high tea at the Victorian Tea Shoppe near my house for special occasions. This page is for keeps. Thanks for sharing. @favored: Thank you so much for your lovely comment and your blessing. I hope this lens brought back happy memories of time shared over a cuppa. Afternoon tea time I sometimes spent with my mother. She would have enjoyed your page. @balancebydesign4u: Many thanks for that lovely comment and for your kind blessing! I'm so glad this brought back happy childhood memories for you! I loved this lens! My mother was from London and we had tea many times a day. This lens brings back such warm childhood memories! Thank you. @AngryBaker: You're very welcome! 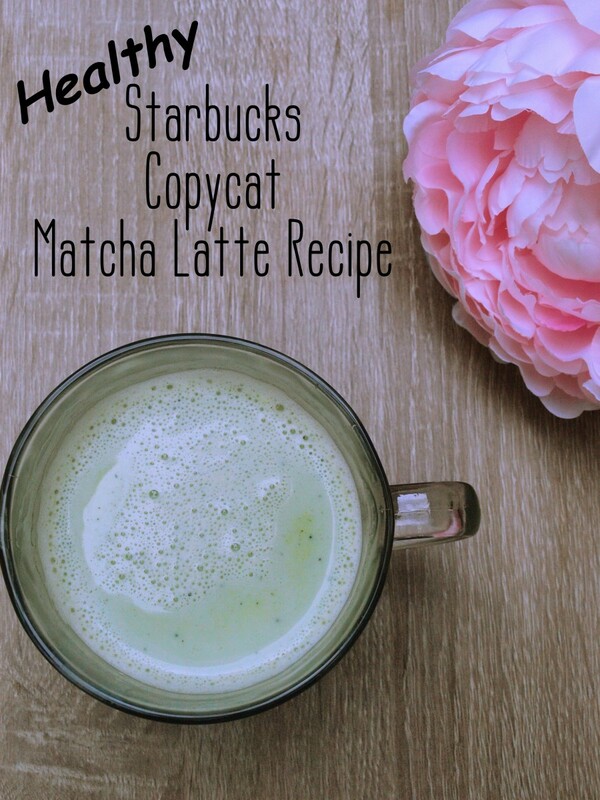 I always enjoy your wonderful recipe lenses and I'm delighted that you enjoyed this one. Thanks for the lovely feedback! @SusanRDavis: Susan, what a fabulous comment! I'm delighted that you enjoyed reading this lens and honored that you have bookmarked it for future visits. Many thanks! I love tea, and the English tea tradition is wonderful. I loved reading this article, including the history, which I did not know - especially the "high" versus "low" or afternoon tea. Thank you for all of this great information. I'm bookmarking this one for future visits to raid the recipe cupboard. And I've already memorized the tea preparation part for improving my tea in the future. @Brandi Bush: Thanks so much for your wonderful feedback and your angel blessing, Brandi! This is a beautiful lens! Love it. You have included everything you ever wanted to know about enjoying and or hosting a tea party. Much like Anna, the 7th Duchess of Bedford, my grandma loved her afternoon tea. This was a lovely reminder and brought back many a fond memory of time spent with my grandma...thank you. Congrats on the well deserved purple star. @AlleyCatLane: Thank you SO much for your wonderful compliments and your Squid Angel blessing! I really appreciate them! Wow! I can certainly see why this article received a Purple Star. It is incredible - beautiful, informative, entertaining, and useful. Blessed! @anonymous: Thanks, Pat! I did read about the emphatic differences of opinion about whether the milk should be added before or after the tea, which I though was rather interesting! I really appreciate your visit and your comment. In England tea is drunk either with milk or black (with or without lemon) - with optional sugar. Opinions are divided as to whether to put the milk in before or after pouring the tea (it does make a difference to the taste!). @Elsie Hagley: Thank you so much for sharing your afternoon tea ritual, and for the lovely compliment and the angel blessing. Much appreciated! I am going to have to try that easy Petit Four recipe. You have such a wealth of information here. I love learning about customs in other countries. I had no idea that afternoon tea could be such an elaborate affair. Blessed. Nice lens. Yes I do have afternoon tea about 3-30pm every afternoon. Nice hot cup of tea, used to brew it in a teapot, but now it's easier to make a tea bag cup of tea straight in the cup. Also used to have something to eat with it when I was younger, but not these days. Thanks for Sharing. Blessed.